Thimbles were probably unnecessary before the introduction of textiles, because people wore skins joined together by thongs passed through holes punched in the leather. Once textiles and thread came into being, thimbles were needed as it was difficult to push an unpolished needle through thick fabric – fingers had to be protected. Often, early thimbles had no tops, instead the side was used to drive the needle though the fabric. Sailors needed help to join heavy canvas sails together, but they wore a kind of leather pad wrapped round a metal plate on the palm of their hand and pushed the needle through with that, rather than wearing a covering on their fingers. The first thimbles were made in wood, bone, leather, tin or bronze, but later brass was used. When needlework became a respectable pastime for well-to-do ladies, thimbles were frequently made in delicately patterned silver, or maybe even gold. Sometimes they were ornamented with precious stones. A thimble was an ideal gift for a young man to give his loved one, because it was used daily and so would remind the girl of her suitor each time she sewed. Thimbles are lucky; years ago it was tradition to put a miniature silver thimble into the Christmas pudding, and the finder would enjoy good fortune throughout the year. The large, iron thimbles which you sometimes see, weren’t so lucky though, certainly not for children, because they were used at nineteenth century Dame Schools for rapping unruly pupils across the head! A game called ‘Hunt the Thimble’ was popular at parties, and it’s fun to imagine how it was invented. No doubt a distraught mother couldn’t remember where she had left her thimble, and so made a game by urging her children to look for it. Perhaps she offered a small prize to the finder. Nowadays most needleworkers never bother to protect their fingers because modern highly polished needles and thinner fabrics mean that fingers don’t get so sore. Even so, millions of people still buy thimbles, only instead of using them in their sewing they place them on display in a purpose-built cabinet. Often, these modern thimbles are not designed to be used at all. Made from china, precious metals, wood, plastic, pewter – even glass, coal or crocheted wool – they are ideal things to collect, because being so small, they take up a limited amount of space. Gift shops sell special display units consisting of wall-hung boxes divided into thimble-sized compartments, and these look very attractive as well as keeping small objects safe. Thimble collectors call themselves ‘digitabulists’. Some specialise by collecting thimbles made just by one factory. Others buy souvenir thimbles from the different places which they visit – nearly every holiday resort, stately home, zoo or museum has its own thimble. Another way to collect is thematically, maybe concentrating on commemorative, advertising, silver, children’s, novelty or enamelled. Or perhaps you are interested in animals, flowers, ships, houses, maps, birds, trains, cameos or cars – whatever your subject, you’re bound to find some thimbles to suit you. Most of the major ceramic manufacturers produce thimbles, including Wedgwood, Spode, Royal Worcester, Coalport and Royal Doulton, and many decorate their wares with classic characters such as Peter Rabbit or Brambly Hedge, which also appeal to collectors in other fields. Recently Wade produced a series of ‘Whimbles’ with various designs including Betty Boop, Arthur Hare and Holly Hedgehog. Again, these would not just appeal to thimble collectors, but to collectors of Wade or Betty Boop too. 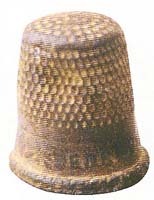 The china company, Caverswall, make many different types of thimble, especially souvenir and advertising, and these are frequently sold at tourist attractions. Novelty thimbles are fun. Often they are made from a metal such as pewter with a moulded figure on the top, beautifully hand-painted. The range is tremendous, from nursery tales such as Alice in Wonderland to animals. There are even representations of famous people, as for instance, the Queen mounted on her horse, ready to Troop the Colour. Thimbles can be obtained with diminutive bibles attached to the side, or with doors which really open, revealing a scene. Some thimbles have a tiny magnifying lens in the tip, which displays a miniature view when placed to the eye. One series of china thimbles was made with holes incorporated into the design – for instance, a tunnel and train or a birdcage and bird. Some thimbles have a top impregnated with perfume, or a wax insert complete with candle wick. The Thimble Guild issued a thimble made from marzipan a few years ago, beautifully decorated with pink flowers! Those that weren’t eaten make unusual additions to a collection. Some of the prettiest thimbles are those decorated with enamels in rich glowing colours or encrusted with small pearls or coloured stones – totally impractical, but very dainty and extremely beautiful. Commemorative collectors will find that all the major events, and many minor ones too, are depicted on thimbles, and so are ideal for adding to a collection. Recent events commemorated include the Queen’s 50th wedding anniversary, the 1999 eclipse, the liberation of Kuwait, the birth of Prince William and the 50th anniversary of the Battle of Britain. Many museums sell replicas of old thimbles, and this is a good way of assembling those rare medieval, Tudor or Roman kinds which would otherwise be very expensive. Often you can obtain thimble cases, which not only hold the thimble but also a few needles, pins, or lengths of thread, and these would certainly enrich a thimble collection, as would other sewing requisites such as packets of needles and pins, darning mushrooms, pincushions, thread-holders, pin cushions, tape measures or embroidery scissors. So a collection of thimbles could soon expand into many other areas, but then, that’s one of the joys – or perils – of being a collector. After an article by Susan Brewer.